Phyton Biotech develops and applies sustainable and “green” chemistry manufacturing solutions for phytochemicals using PCF®, serving the Pharmaceutical, Traditional Chinese Medicine (TCM), Cosmetic, Agricultural and Food Ingredient industries. Utilizing our revolutionary PCF® platform, Phyton offers a time, risk, and cost-balanced path to commercially viable production processes. With certified GMP facilities in Germany and Canada, Phyton combines highly developed technology and quality to meet our global customers’ needs. We have a successful track record of developing and implementing innovative contract development solutions for clients around the world. PCF® provides many advantages over traditional methods of developing and producing phytochemicals. Read our Green Biochemistry case study on paclitaxel. Recombinant therapeutic proteins are high-value biopharmaceuticals for which the demand continues to increase dramatically. To produce these proteins requires cost-effective and advantageous expression hosts, which allow for dedicated genetic engineering of a given protein. In general, plants are considered superior hosts in terms of safety as they do not serve as vehicles for human viruses or TSE. At Phyton, our plant cells are cultivated under controlled conditions avoiding any animal-derived media components, thus further improving safety. In addition, plant cell cultures, and their industrial application within our PCF® process, are highly reliable means of commercial production which is not affected by environmental factors. 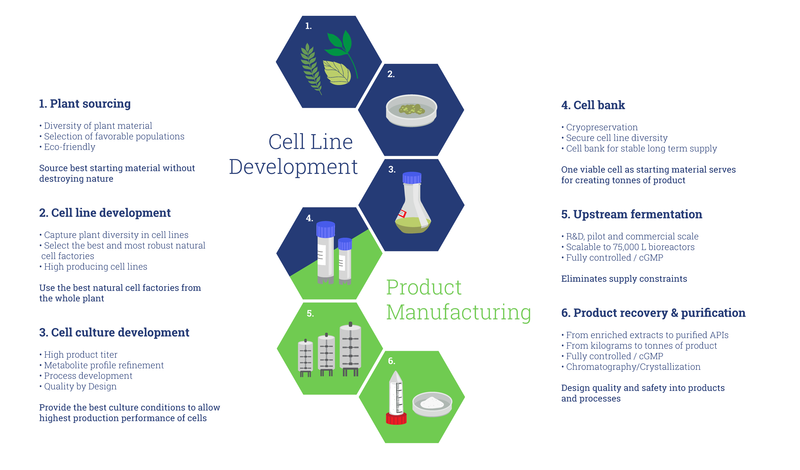 Phyton has developed a plant cell line – The Universal Host™ – which provides favourable conditions for the manufacture of both complex and unmodified proteins. Phyton has the world’s largest BSL-1-approved bioreactor cascade in place (7500 L) authorized for use with genetically engineered plant cells. Phyton has extensive expertise and know-how in genetic engineering with special emphasis on complex proteins. The Universal Host™ can also be applied in the metabolic engineering of a diverse range of secondary metabolites.